2008 has concluded and Palm released no new devices running either the classic Palm OS Garnet or its Linux-based Palm OS II, aka "Nova" over the course of the year. Palm did, however, release several Windows Mobile handsets in 2008 in an attempt to tide the company over during its transition period into what will hopefully be an exciting 2009. Looking back at our WM-based Palm rumor analysis article from this past May, nearly all of the various rumors and predictions turned out to be fairly accurate, minus one missing device ("Wanda") that never materialized. The mysterious device codenamed "Drucker" turned out to be the GSM Treo Pro (aka Treo 850), launched this past October. Additionally, the CDMA version of this device, rumored to be heading to Sprint in January '09, could very likely be the device bearing the "Skywriter" nickname. "Zeppelin" ended up as the much-maligned (and reportedly soon-to-be-EOL'd) CDMA Treo 800w, available exclusively on Sprint. Lagging behind its newer, sexier Treo Pro stablemate in many key aspects, this device never gained the critical praise of the Treo Pro or the sales success of the Centro and appears likely to set the record for the shortest official lifespan of a Palm-branded device, whether PDA or smartphone. 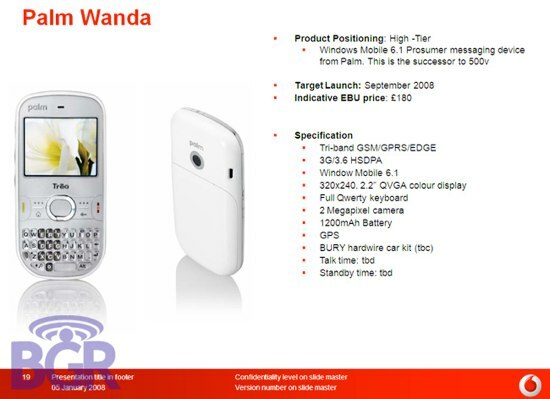 "Wanda" remains the most intriguing Palm Windows Mobile-based device of 2008, for the simple reason that it never appeared! A thorough perusal of all the usual online sources has revealed absolutely nothing about this device past the initial rumor frenzy in January. First outed via some very detailed internal Vodafone slides back in January of this year, the "Wanda" Treo 500 successor quietly disappeared without any subsequent news. Had the device arrived as promised, it would have brought a handful of small but appreciated updates to the Treo 500; Windows Mobile 6.1, full HSDPA 3G connectivity and integrated GPS. As of this writing, the original Europe-exclusive Treos, the 750v and 500/500v, remain available on both Vodafone and Palm Europe websites. Looks rather like the Treo Pro. Or rather a preliminary version thereof, before a battery upgrade and improved screen. Why are you responding to your own articles like this? That's just plain... odd. Are you afraid of posting here as hkklife when you go to the CES schmoozefest? Stop by our booth this week for a chat. Don't be afraid to speak your mind. Ummmmm, sorry, Pal. That's not me. Just like how "FrequentVisitor" is not "SeldomVisitor" who is appartently not "Hengeem". Giggle! I'll respond to my own articles as myself and have done so in abundance recently. Well, at least not here. In the deep distant past I =was= "frequentvisitor" but on a different board and for the same reason, I expect! And "hengeem" is indeed still me on Yahoo, though here "hengeem" is that something-Lyons guy down in Georgia. Here, though (and on TreoCentral, for that matter), I am and always have been ONLY "seldomvisitor". I suspect Carl is still 'sore' from our failure to accept his 'inside track' at face value. "Simple BS. Anyone smart enough to be on the 'A-List' for a sneak peek of the presentation would have been SMART ENOUGH to remember the big NDA they signed. (Sorry Carl, don't mean to use big words: that's Non Disclosure Agreement for you) A shout out to skinny-g. My buddy J-dog, and the rest of my homies with tired fingers at the Palm NOVA team. Wheel show em [sic]. Raise a glass! Cha-chink!" I have to say, I agree with "kfife". Clearly he's smarter than the average bear.